The Celtics are back and have their sights set high for this upcoming year. With a young talented roster, Boston looks poised to regain their spot atop of the Atlantic Division and bring home another NBA championship. Division rivals, the New York Knicks and the Brooklyn Nets will fight to keep the Celtics down. Get out to a Boston Celtics game and be there when your team battles for conference supremacy. During their 2017-18 run, the Celtics came pretty close to playing in another round of NBA Finals. However, they lost to the Cleveland Cavaliers, 4-3, in the Conference Finals. But with talent like Al Horford, Kyrie Irving and Jayson Tatum on the roster, the Celtics can once again not only play in the NBA Finals during the 2018-19 season, but also win their 18th NBA Championship. If you want to see that happen right before your very eyes, get your Boston Celtics tickets now. The Boston Celtics were established in 1946. They have won 17 NBA Championships, the most of any NBA team. With 30-plus Hall of Famers, the Boston Celtics can boast of unparalleled legacy, full of greatest moments ever recorded in professional basketball. Clash of the Titans – NBA pundits have called 1962 NBA Championship the greatest NBA Finals series in league history. The series was fought between the Boston Celtics and the Los Angeles Lakers. In reality, the series represented the clash of two NBA giants – Celtics’ Bill Russell and Lakers’ Wilt Chamberlain. Game seven of the series is still etched in fans minds as it was played in Boston on April 18, and finished in OT with final score, 110-107 Celtics. Russell’s 40 rebounds in that game is an NBA Finals record. The “Big Three” vs Hakeem “The Dream” Olajuwon – The 1986 Celtics’ team comprised of dynamic offensive players and arguably the greatest trio in Celtics history – Larry Bird, Kevin McHale and Robert Parish. The 1986 season also saw the Celtics yet again in the NBA Finals series. This time around, they were pitted against the Houston Rockets. The Celtics defeated the Rockets four games to two to win their 16th NBA Championship, their last until 2008. Larry Bird was named the Finals MVP. The Los Angeles Lakers, the Orlando Magic and the Philadelphia 76ers are three of the biggest rivals of the Boston Celtics. Celtics – Lakers Rivalry – The two share between them 33 NBA Championships. Is it any wonder then that theirs is called a storied rivalry and also for some, the best rivalry in the NBA. The Celtics and the Lakers have met in the NBA Finals for a record twelve times. In addition, this rivalry was intensified thanks to the clash of personalities – Bill Russell vs Wilt Chamberlain and Larry Bird vs Magic Johnson. The rivalry somewhat subsided when Johnson and Bird retired, but picked up again in 2008 and 2010 when the teams faced off again in the NBA Finals. Celtics – 76ers Rivalry – The Celtics may have met the Lakers in the NBA Finals on twelve occasions, but it’s the 76ers they have had the most bouts with in the playoffs – 19 to be exact. Out of their 19 playoff meetings, the Celtics have won 12. The 76ers are the Celtics’ biggest rivals in the Eastern Conference and like other great rivalries, pitted the best players against each other. In this case it was Bill Russell vs. Wilt Chamberlain. After these giants retired, the rivalry came to be known as the one between Larry Bird and Julius Erving. Once the team of basketball gods like Bill Russell, Larry Bird and Kevin McHale, the Boston Celtics are the most successful franchise in NBA history. As such, fans in Boston have been lucky to watch some of the game’s best players pace the floor. Bill Russell – The NBA Finals MVP trophy is named after Bill Russell for a reason – he changed the way basketball is played. When he joined the Celtics in 1956, basketball was a horizontal game; when Russell left, it had become a vertical game. With his 6’9” stature, Russell dwarfed everyone one the floor and used his athleticism, superb instincts and length to dominate the floor. Larry Bird – Bird wasn’t the best athlete on field, but what he lacked in athleticism he made up for in sheer creativity. He was a true five-tool player, who couldn’t be covered offensively. Though towards the end of his career, his physical abilities diminished, still Bird managed to run the Celtics offense and bombed away from three-point range. John Havlicek –“Havlicek stole the ball!” one of NBAs immortal phrases are coined after his 1965 Eastern Conference Finals exploits. Popularly known as “Hondo”, Havlicek averaged 20.8 points, 6.3 rebounds and 4.8 assists while shooting 43.9 percent in his career. If you want to see the Celtics bring back another Big One home this season, then get your Boston Celtics tickets 2018-19 here. The Celtics have made it to the playoffs consistently since 2007-08 season and this season is expected to be no different. To see it all happen before your eyes, you have got to be at the Celtics home, TD Garden. Head out to TD Garden and get in on the Bostonian action. Hosting one of the most successful franchises in all of sports, the Garden is filled with championship banners for fans to relish in. The arena is built on top of Boston's North Station making it highly accessible for patrons to get to and from games. Fans can also enjoy pieces of Celtic history with The Sports Museum. Get you Celtics tickets here at ScoreBig today! Our process for purchasing cheap Boston Celtics tickets is simple and fast. There are so many online ticketing sites, that it can be hard for customers to find the right place to buy Boston Celtics tickets at the cheapest price. At ScoreBig we think of our customers first and foremost. We offer daily deals for Boston Celtics events, so our customers can get the best seats for the best prices. ScoreBig will always go above and beyond to offer the cheapest Boston Celtics tickets on the market. The Boston Celtics schedule above, displays all available events for 2019 and 2020. Once you find the event that you would like to go to, click the red “Get Tickets” button. It is located on the right-hand side of the event listing, it will take you to an Boston Celtics event ticket page. ScoreBig's event ticket page will display all available Boston Celtics tickets for that event. On the event ticket page to help with your search for the right Boston Celtics tickets, use the filters at the top to select quantity, price range, and more. There is also an interactive seating chart so you can pick where you want to sit. When you are ready to buy a ticket, click on the listing, and you will be directed to ScoreBig's checkout page. Upon completion of the information fields, your order will be processed and your Boston Celtics tickets will be delivered via email, mail, or to your mobile device. What makes ScoreBig’s site stand out from the rest? We are constantly analyzing our competitors to improve our site, service, and prices. ScoreBig.com employees strive to offer the best process and experience to buy cheap Boston Celtics tickets. Our goal is to get you the best seats to Boston Celtics events. We offer daily discounts on our site and for special promotions check out our newsletter. If there are no Boston Celtics events currently available, you can use our search feature at the top of the page to see a list of all popular events going on near you. No matter your price point, we have all the best deals and discounts on Boston Celtics tickets. For more information on prices of Boston Celtics tickets and the schedule for Boston Celtics, check out our listings above. The last thing you want to find out is when the Boston Celtics event you wanted to go to is sold-out. Don’t worry in many cases ScoreBig has affordable tickets to sold out events. We sell tickets from GA all the way to premium seating and parking. Skip the scalpers in the parking lot and get your tickets online from top Boston Celtics ticket brokers. We get you in all events, buy your Boston Celtics tickets here from a brand that many trust and rely on for all their ticketing needs. ScoreBig offers a 100% money-back guarantee. If you have been in search of cheap tickets for Boston Celtics, ScoreBig by far is the best option. That’s why ScoreBig has more loyal customers than any other ticketing site. 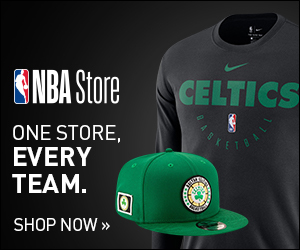 Shop at ScoreBig for safe and secure Boston Celtics event tickets.